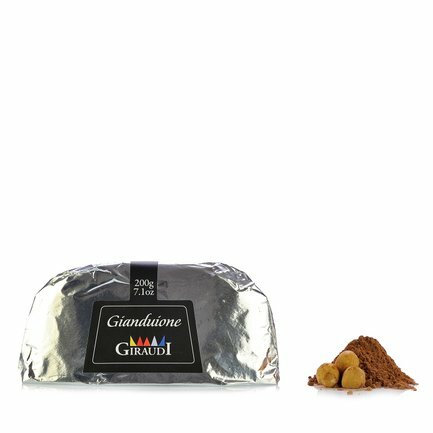 The Giraudi Artisanal Chocolate Confectioner offers you a superb Piedmontese classic: the Gianduione, in its dark chocolate version. The wholesome goodness of this biscuit is due to the presence of Piedmont IGP hazelnuts, selected and prepared with the original historic methods, which is blended perfectly with the cocoa to deliver that distinctive unique flavour at each and every morsel. Ingredients Toasted Piedmont hazelnuts I.G.P., cane sugar, cocoa butter, bitter cocoa powder 22/24, cocoa beans. ALLERGENS: hazelnuts, milk proteins; may contain traces of: nuts, egg proteins, sesame, peanuts, gluten, sulphites. For more information on product labels, please contact our Customer Service department. The information on the labels of the products may vary for reasons beyond our control, therefore, there may be discrepancies between the information on the site and that on the products delivered. Please always check the information on the product before consumption or use. More than 100 years ago one of the Giraudi family's ancestors started making bread, biscuits and a selection of desserts in his small bakery. His products proved popular and the firm started to expand. Today it's run by Giacomo Boidi who, together with family members, partners and personnel, pursues a path based on solid tradition and immense passion for top quality foods and painstaking dedication in selecting only the finest ingredients.